Call them newspaper condos. At some point soon, a "modular distribution box" will be coming to the intersection of Seventh Avenue and Ninth Street designed to address the issue of dozens of individual news boxes at the intersection. (There are, for instance, 14 boxes near Smiling Pizza at Seventh and 9th.) 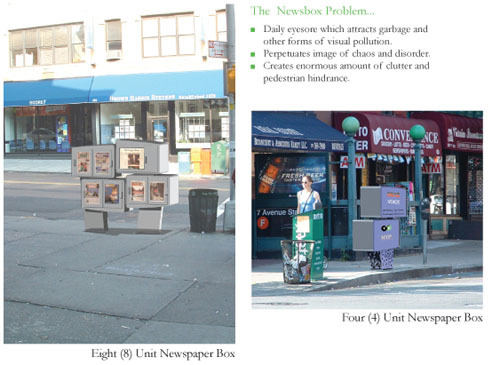 The "news box clutter" issue is not unique to Park Slope or to Brooklyn. Seek out a busy New York City streetcorner, especially ones with subway entrances, and you'll find dozens of boxes serving as everything from, well, newspaper distribution boxes to trash receptacles. In any case, the Park Slope Civic Council is teaming up with a firm called CitySolve for a demonstration project, with each footing the bill for half the cost of the $2,000 newspaper condo. Each box holds eight papers, including free ones. They are designed with sloping tops so that people can't leave things on top of them and with graffiti-proof surfaces. Given the First Amendment issues involved, publishers are asked beforehand to participate in the demonstration project. The ultimate goal is to get the city to fund placement of the newspaper condos as a streetscape improvement measure. Could be a winner.